A newly emerging field like Science and Technology Studies (STS) must find ways to navigate a space populated by powerful, typically discipline-based structures. Those involved in fostering STS centres and communities have needed ingenuity in working out how to do this in their particular national and institutional context. STS scholars have, in differing ways, learnt to spin a web at the interstices of disciplinary power blocks, to adapt to changing circumstances, and to navigate periodic radical realignments in this landscape. In this sense the histories of particular STS centres are diverse, as amply demonstrated in this series of accounts of ‘STS Multiple’, even though they also exemplify strategies for tackling a broadly homologous set of problems. Fig. 1: 2015 ISSTI retreat Newbattle Abbey 8th – 9th June 2015. Some parts of the Edinburgh story are well-rehearsed… The origins of SSU can be traced back to an initiative in 1964 to broaden the education of the university’s science undergraduates by the renowned geneticist C. H. Waddington (1905–75) and other leading Edinburgh scientists, including the physicist Peter Higgs. The Committee on Providing a Broader Basis for the Science Degree sought to reduce the separation between the ‘two cultures’ (of the arts and the sciences), which had been highlighted by C. P. Snow’s famous ‘Two Cultures’ lecture in 1959 (Henry 2008). 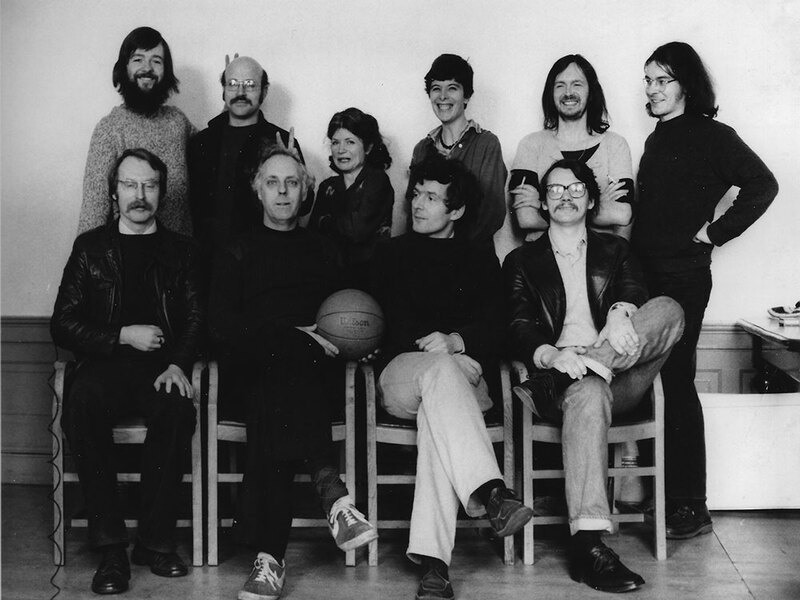 Back row, left to right: Mike Barfoot, Steven Shapin, Carole Tansley, Moyra Forrest, Andy Pickering, Dave Smith. David Edge, a physicist with a PhD in radio astronomy, but then working for the BBC Radio Science Unit, was enlisted to deliver this teaching. He proposed a new undergraduate course for science students: “to remedy an ignorance … amongst science graduates of major aspects of civilisation, such as literature, art, religion and philosophy, and of the strategic issues of science [editors note: this refers to the funding and organisation of science], and (b) to bring out the ways in which the development of science has influenced and is influencing, various aspects of human life…”1 David Edge also suggested the proposed new department should also have a research remit and outlined a number of issues that might be addressed. Funding was secured for 5 years from 1966 from the Wolfson Foundation to develop this work on an experimental basis. It was so successful, that, at the end of this period, the university took over funding. David Edge made a series of inspired appointments: the sociologist Barry Barnes, the philosopher David Bloor, and historians Gary Werskey and later Steven Shapin. These turned the Unit into an exciting site of scholarly historical and sociological research on science (Barnes et al 2003). Their foundational work established the sociology of scientific knowledge: the idea that the content of science itself, not merely its social context institutions, funding, personnel etc, was amenable to sociological enquiry. Their distinctive and influential ‘strong programme’ in the sociology of scientific knowledge became known throughout the world as the “Edinburgh School”. 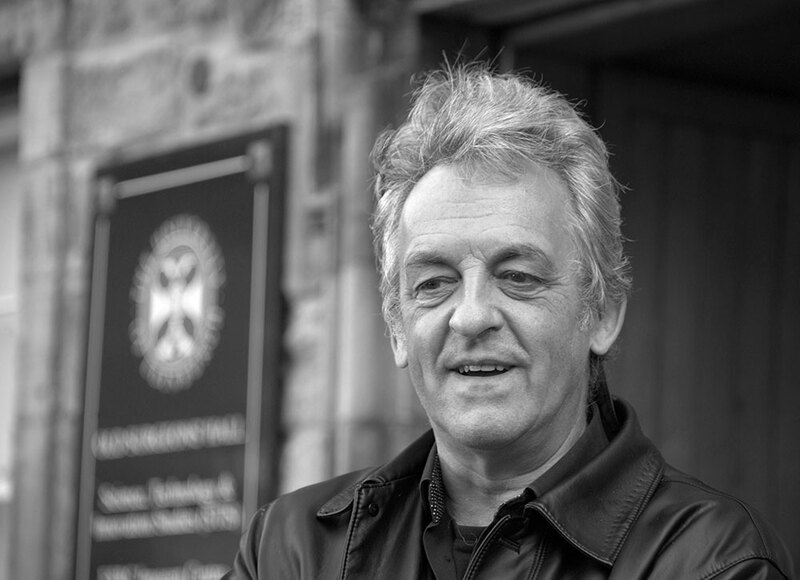 David Edge committed his energy to creating a supportive space for this path-breaking scholarship at Edinburgh. He also supported the development of the field more widely, notably by launching (with Roy MacLeod) and editing for 32 years the journal Social Studies of Science. This decisive step, in opening the production of scientific knowledge up for social scientific enquiry – was just one of a number of ways in which David Edge challenged established boundaries. He also emphasised an interdisciplinary approach that cut across divides between history and sociology –and also the boundary between natural and social sciences. We recently rediscovered parts of this story. As part of our celebrations of the SSU 50th Anniversary we have been developing a Memory Collection – eliciting recollections from alumni and former colleagues. As we sorted though materials from retired colleagues we encountered other parts of the story that were about to fall out of the institutional memory. We were reminded that David Edge had collaborated with Harry Dickinson – a lecturer in the Electrical Engineering Department with an interest in developing countries. They secured awards from the (then) Science Research Council to fund PhD studentships and postdoctoral research fellowships on Appropriate Technology. This programme was disrupted by Harry’s untimely and sudden death in the autumn of 1983. This example forces us to reflect upon the uneven processes by which past contributions may succeed or fail to become part of the historical record. We note that certain kinds of communal work, and the contributions of those who fall by the wayside, can easily be overlooked. Edinburgh’s interdisciplinary tradition took another radical turn in the 1980s, to encompass technology studies, inspired by the edited collection that Donald MacKenzie and Judy Wajcman developed on The Social Shaping of Technology (SST) (MacKenzie and Wajcman 1985). Donald MacKenzie had fostered a group, including David Edge, Martin Fransman2 and Frank Bechhofer3, which secured seedcorn funding to create a post of coordinator of social and economic research on technology, based in the Research Centre for Social Science. 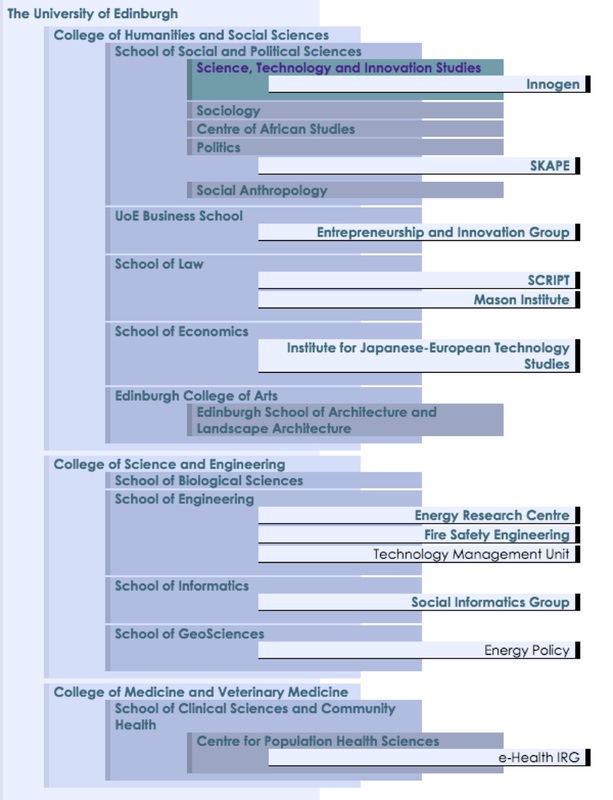 Robin Williams was recruited to this post in 1986 and led Edinburgh’s successful bid under a major funding initiative by the UK Economic and Social Research Council (ESRC): the Programme on Information and Communication Technologies (PICT). Its core group was extended to ‘the gang of six’ with the appointment of Jamie Fleck (like Robin from Aston University Technology Policy Unit) to the Business School. Edinburgh PICT ran from 1987 – 1995. It formed the core of a strongly interdisciplinary research programme into the social shaping of technology – and in particular Information Technology. The technology studies research community grew rapidly through the 1980s with major awards from science as well as social science funding bodies. European links – always strong – became increasing dynamic through Edinburgh’s involvement in a European COST Action – A4 on the social shaping of technology – which provided a platform for many awards under European framework programmes. In the immediate aftermath of PICT, a number of more or less long-lived specialist groupings emerged such as Martin Fransman’s Institute for Japanese-European Technology Studies (JETS) in Economic and Alfonso Molina’s Technology Management programme in the Business School Innovation and Entrepreneurship group. Consequently, scholarly capacity was distributed across a number of specialist centres. A key strategic development was the formation in 2000 of the Institute for the Study of Science, Technology and Innovation (ISSTI). This initially brought togeter these specialist centres, SSU, Sociology and the technology studies programme based in RCSS. ISSTI was coordinated by Robin Williams and hosted within RCSS. Specialisation has benefits but also brings risks of fragmentation of intellectual effort and duplication of effort. By weaving these groups into a dense framework of collaborations, ISSTI worked to ensure intellectual cross-fertilisation and share the costs of support for the development, conduct and dissemination of research. 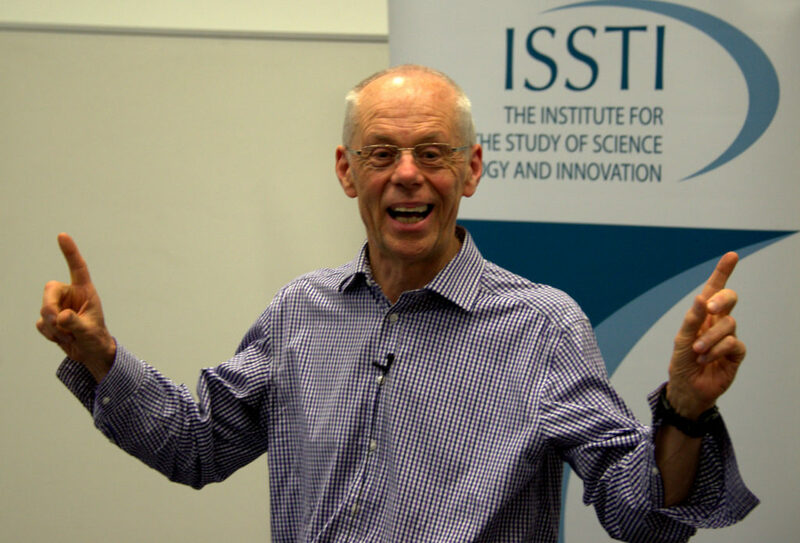 ISSTI’s mission was to present Edinburgh’s work more effectively to external audiences (funding bodies, policymakers, private and public stakeholders) and above all to promote interdisciplinary research. Aided by a flow of external research funding awards collaboration was extended right across the university. Figure 3 seeks to map some of these engagements. A distinctive model for Edinburgh research has emerged over recent decades. At its core is an emphasis, building upon the SSU tradition, on work that is empirically detailed and conceptually innovative. The continual engagement with new frontiers – empirically and conceptually – brings a sense of excitement, as exemplified in recent years by Donald MacKenzie’s adventurous intellectual journeys. Our work has benefitted from The University of Edinburgh’s strengths in Science, Engineering, Medicine and beyond. The confident approach of leading practitioners to their own subjects of study facilitated cross-disciplinary dialogue (supported by Edinburgh’s distinctive collegiate ethos and University policies that strongly favoured interdisciplinarity). Particularly close collaboration was established over the last three decades with Stuart Anderson, Rob Proctor and other colleagues from Informatics in developing a profoundly sociotechnical understanding of how the design and implementation of computer-based systems could create solutions that were more dependable and better matched to user requirements. Research extended into other areas, with major strands of work on energy, environmental sustainability and life science innovation. Much of this work also involved new and closer kinds of engagement with policy and wider publics. In 1998, Robin Williams and Joyce Tait secured a Research Development Grant from the Scottish Higher Education Funding Council to establish the Scottish Universities Policy Research and Advice Network: Science, Technology and the Environment. This supported the expansion of Edinburgh research and stakeholder engagement into innovation in the life sciences (e.g. in medicine and agriculture). This paved the way for a successful bid by Tait, Williams, Wield and others for an ESRC Centre for Social and Economic Research on Innovation in Genomics (2000 – 2012). The Innogen centre continues after the cessation of ESRC core funding with a focus on innovation generation in the life sciences. A complex ferment has emerged of different kinds of work – ranging from traditional sole scholarship to more collective policy-oriented projects in which STS researchers collaborate with domain specialists and stakeholders. We have been able to foster a vibrant research community through a diverse research ecology of differently configured projects interacting together. Growth based on external income poses particular challenges for investigators and especially research staff. There are acute pressures with policy-oriented research to meet the needs of government sponsors and innovation communities. Moreover research is shaped by a highly turbulent and increasingly competitive funding context that makes it difficult to develop expertise and reputation in a planful manner. Members of the Edinburgh community have had to learn how to play a ‘multi-level game’ – applying our own analyses of the challenges of interdisciplinary research and policy engagement to our own practice. Researchers, individually or in small groups, are encouraged to consider how meeting stakeholder needs can be combined with addressing personal scholarly goals in terms of building their substantive knowledge base, elaborating underlying conceptual frames and developing methodological skills, as well as advancing their reputation and personal publication record. This may, for example, involve building longer-term programmes of enquiry around a succession of shorter-term awards. Though much of our work has emphasised engagement with policymakers and wider publics, Edinburgh researchers proactively discuss ways to avoid being cast into particular presumed roles by policymakers or practitioners. A distinctively collegiate culture has been fostered over the years. Colleagues from different traditions are encouraged to join the weekly coffee meetings. In these and other informal spaces colleagues can identify and explore synergies between different analytical traditions and streams of research. As the various specialist nodes have grown, ISSTI has evolved into a network of research networks allowing specialisation around particular agendas to be coupled with benefits of scale and of scope. To counter tendencies to fragment between different domains of study and analytical traditions – a key part of our intellectual life is the annual ISSTI retreat where 60 or so colleagues come together for 2 – 3 days – removed from the day-to-day grind of teaching and administration. The retreat involves external keynotes to inspire the community with new ideas; sessions designed to explore common interests and cross-fertilise between the huge array of research under way. These also serve to induce new colleagues and involve them in our distinctive collaborative culture and styles of work. Social informatics – close collaboration between STIS, Informatics, Business School to understand the sociotechnical character and implications of the ICTs–with a closely linked Interdisciplinary Research Group in e-health convened by Claudia Pagliari. Recently this work is applying STS perspectives to understanding and informing the growth of data science. Synthetic biology – STIS scholars like Jane Calvert have developed a close collaboration with synbio researchers. Rather than becoming cast into traditional roles – for example as the people who address risk governance and innovation – we have sought a more open-ended exploration, working with scientists and also with artists, on what it means to engineer life. Collaborations with Law – our involvement in the Scottish Centre for Intellectual Property and Technology Law led by Burkhard Schafer in Law led to our participation in the AHRC Centre for Copyright and New Business Models in the Creative Industries: (CREATe). Life Sciences – Gill Haddow collaborated with Graeme Laurie and Shawn Harmon to establish the Mason Institute: an interdisciplinary network aimed at investigating the ethical, legal, social and political issues at the interface between medicine, life sciences and the law, particularly in relation to biomedical research and innovation. History of Medicine – the continued importance of historical studies at Edinburgh, also to deepen the understanding of contemporary work, is reflected in recent successes by Miguel Garcia-Sancho and Steve Sturdy in securing funding for the History of Medicine. Science, Knowledge and Policy – Steve Yearley is working with colleagues from Politics in SKAPE – centre for Science, Knowledge and Policy to explore processes of knowledge production, translation and use involved in the development and implementation of policy. Edinburgh scholars have sustained a high level of external research funding. Our continued success has been facilitated by public research policies that have favoured interdisciplinary and collaborative research. This has opened up opportunities to secure research funding from i.a. the Engineering and Physical Science Research Council and the Royal Academy of Engineering as well as ESRC and also to secure funding under EU framework programmes as well as from the European Research Council. Research funding however provides a rather unstable base for growth in capacity. STS has been seeking ways to leverage strengths in research and teaching to substantially expand our community. We have managed to take advantage of UK Higher Education policies. In particular since 1996, Research Assessment Exercises (RAE) that measures research excellence and rewards work of international impact. STS has found a welcoming home in Sociology at Edinburgh and nationally; work is returned within the sociology panel in the RAE and its successor the Research Excellence Framework. And Edinburgh STS scholars brought in significant Research Quality income. Perhaps in parallel with this, the University of Edinburgh has been restructuring. Its previously successful model of supporting small experimental units, was seen as less able to achieve quality and international recognition. From 2000 the university strategy revolved around creating larger units. This came shortly after the failure of the attempt by SSU to establish its status as department within the Faculty of Science. This was a period of attrition – particularly after the retirement and tragic death of David Edge. Staffing levels fell as the turnover of core staff did not always secure replacement. Across the University small departments in cognate fields were brought together in large multidisciplinary schools. SSU and RCSS became classified as Units within Sociology subject group in the newly formed School of Social and Political Science. To some, things looked bleak. However, these developments also saw a shift in the university’s resource governance systems that held the seeds of renascence. The new planning system in the University of Edinburgh allowed operational units to track income accruing from all sources – from undergraduate and postgraduate teaching, from research income, from the excellence and impact of research outputs. This had the paradoxical outcome of revealing SSU and RCSS as both generating substantial surpluses. Though some objected that the new arrangements subjected operating units to market pressures, we realised that this exigency created scope to make new appointments for those able to project new income streams –in particular from postgraduate offerings. These formalised resource allocation criteria made us less dependent on diplomatic engagements with senior university decision-makers to advance the claims of STS in competition with established disciplines. 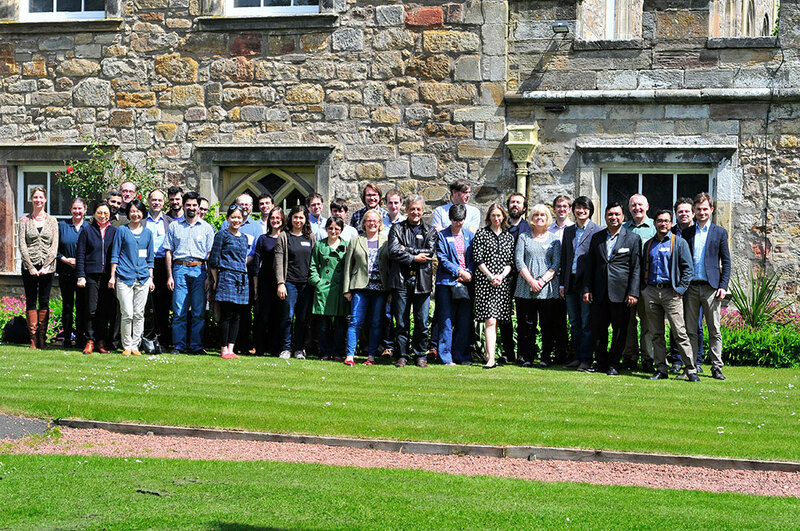 RCSS under the PICT programme had established one of the UK’s first doctoral programmes (the Doctoral Programme of Socio-Economic Research on Technology), convened by Wendy Faulkner. This post had, for administrative convenience, been located in SSU. Its success rejuvenated the SSU’s Doctoral Programme. The two programmes grew in tandem, and it became evident that doctoral students from SSU and RCSS could not readily be distinguished. Building on courses launched for the doctoral training programmes, a modular array of MSc offerings gradually developed. These developments encouraged increasing interaction between RCSS and SSU, despite their different histories and cultures. The two centres had complementary strengths. RCSS brought in substantial research income and wider engagements, while the SSU survey courses, delivered to large numbers of science students, were suddenly revealed to be highly profitable as they received a higher level of government support than social science students. Robin Williams worked with John Henry, who had taken over as SSU Director and Stewart Russell4, RCSS Deputy Director, to explore the benefits of a closer relationship. The first move was the co-location of SSU in Chisholm House, adjacent to RCSS in Old Surgeons Hall. This facilitated intellectual integration. Our PhD students were also co-located. They have thrived on close interaction with each other and with academic staff. With increasing numbers, research students have become important part of our lively culture: offering mutual support, a strong sense of shared identity. Their enthusiastic support underpins a range of activities including growing use of social media, and, most recently, our own Youtube channel with a growing library of video recordings of workshops and ISSTI retreat presentations. Eventually RCSS and SSU merged in 2008 to constitute the Science, Technology and Innovation Studies (STIS) ‘subject group’ within the School of Social and Political Science. This new status has enabled a more planful approach to career planning and capacity development – and in particular a strategy for growth based on new teaching development. We have sought to overcome the dichotomy in many UK universities between research fellows and conventional lecturers by creating research intensive lectureships supported by high levels of research income. STIS has a rotating headship. Its founding Head of Subject, Robin Williams was replaced by Steve Study and then Cathie Lyall, who is the current head. Today STIS has over 40 staff and a similar number of PhD students. STIS is the core, but only accounts for about half, of our total community of ISSTI scholars across the University of Edinburgh. This dual identity may seem confusing to outsiders, but is, arguably, key to our success. And by continuing David Edge’s tradition of challenging existing boundaries, building new relationships with colleagues from natural science and engineering, as well as social science and humanities, and by engaging with practitioners, policymakers and diverse publics we look forward to another half century of excitement and growth. 1 David Edge, B.B.C. Proposed New Department of Science Studies at Edinburgh University, mimeo: May 1965. This is part of an archive of material relating to the establishment of SSU, being analysed by Lawrence Dritsas and Neil Tarrant at STIS. 2 Martin Fransman was appointed in 1978 to a joint post in Economics and African Studies. His research shifted from African Development in the 1980s to the rapid development of engineering and then information technology in Asian tiger economies. 3 Frank Bechhofer had established the Research Centre for Social Sciences (RCSS) in 1984 with a remit to promote and host high quality, interdisciplinary research in two areas : social and economic research on technology and Scottish social and economic life (the latter work shifted to the Institute of Governance when Frank retired). 4 Stewart Russell joined the Research Centre for Social Sciences in 2006 as Deputy Director. Till his untimely and tragic death in 2011 he helped build interdisciplinary research programmes, particularly around energy technology and policies. His sustained efforts in developing our joint postgraduate programmes with the Science Studies Unit paved the way for the establishment of the Science, Technology and Innovation Studies subject group. Robin Williams is Professor of Social Research on Technology in the School of Social and Political Science at the University of Edinburgh. He studied Natural Science and Social and Political Sciences at Cambridge and took his PhD at the University of Aston, Technology Policy Unit before being appointed coordinator of socio-economic research on technology at the University of Edinburgh in 1986. His research into the social shaping of technology focuses on the design, implementation and use of Information Technology. His latest books, arising from his collaborative research with Neil Pollock into the biography of (enterprise system) artefacts and practices, are Software and Organisations: The Biography of the Enterprise-Wide System - Or how SAP Conquered the World (2009: Routledge) and How Industry Analysts Shape the Digital Future (2016: Oxford).